It’s a 3-D world. So why not market that way? 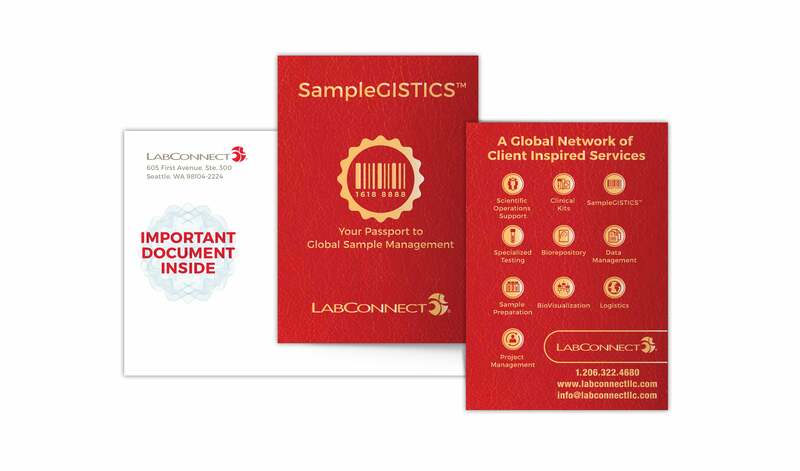 LabConnect, a global provider of central laboratory services, recently sought to boost its brand awareness and lift sales for three of its core services. Always in pursuit of inventive marketing solutions, SCORR brainstormed and developed a unique trio of tactile, 3-D mailers to pique interest in the three services, elevate recall of the LabConnect brand name and generate more sales callbacks. 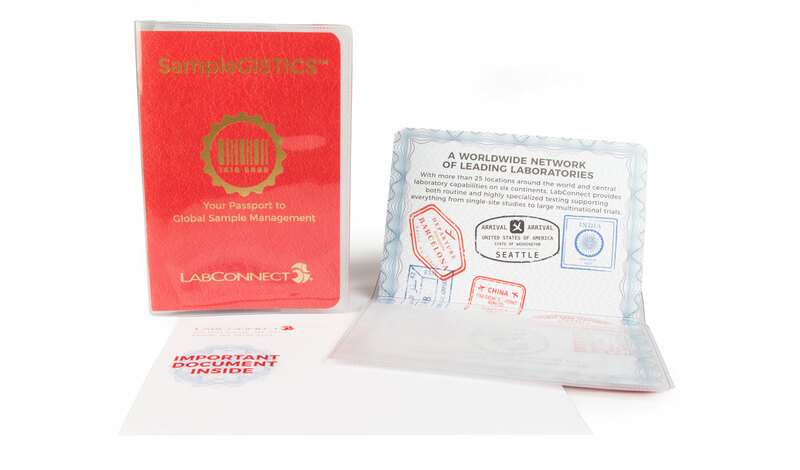 To draw attention to LabConnect’s international sample tracking service, SampleGISTICS™, SCORR developed an ingenious leatherette passport mailer complete with stamped inside pages and a reusable plastic cover that could also be used for the recipient’s real passport. 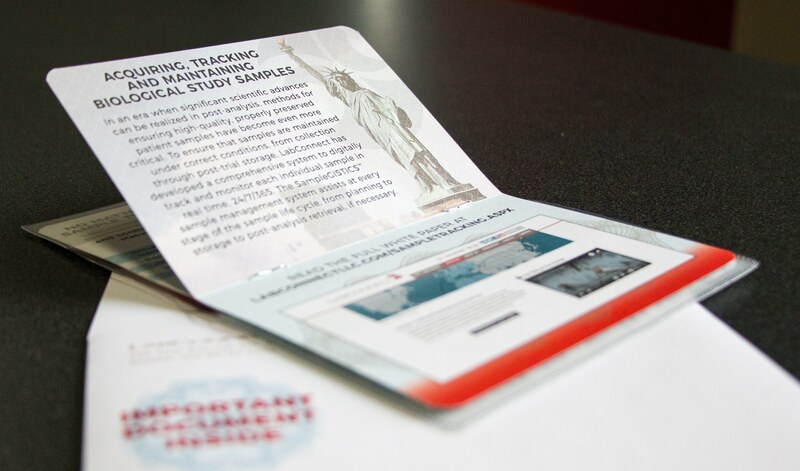 In a creative way, the mailer promoted LabConnect’s real-time tracking capabilities from collection to storage — anywhere in the world. It invoked an image of the company’s global reach across country borders, time zones and continents, providing constant visibility of the samples’ locations and status from collection, through logistics to receipt at any laboratory or storage location in the world. 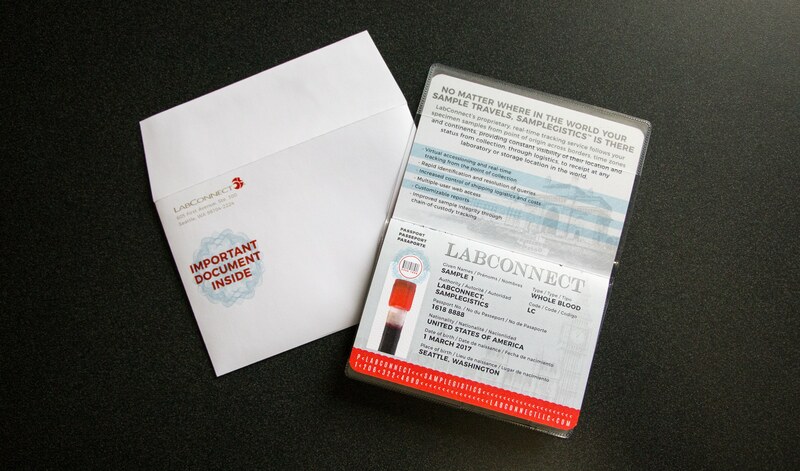 The passport’s memorable and useful format made it a handy, pocket-sized information resource for LabConnect business development teams and staff to share with clients. 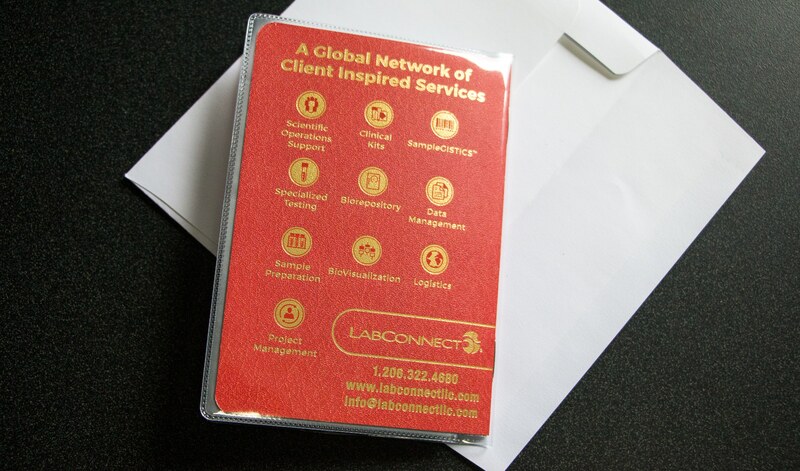 The clever design sparked increased engagement from prospects and clients, better recall of LabConnect’s services and higher response rates. 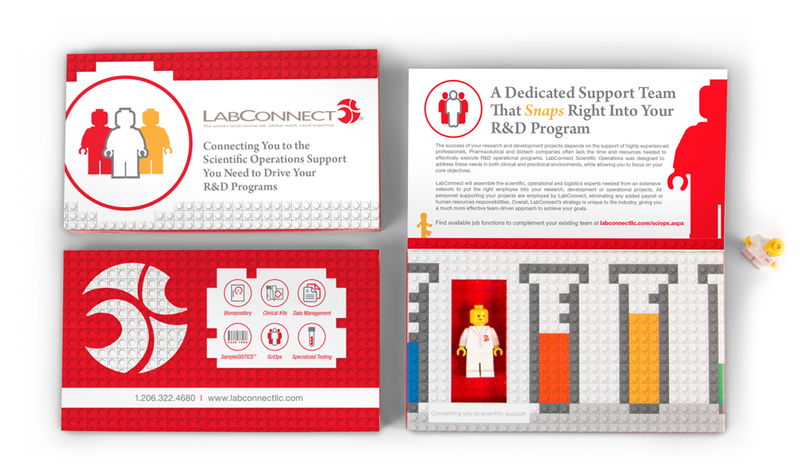 Eliciting memories of childhood, SCORR developed a LabConnect mailer using Lego bricks to illustrate how the company’s Scientific Operations (SciOps) program links dedicated support teams to clients’ research and development functions. 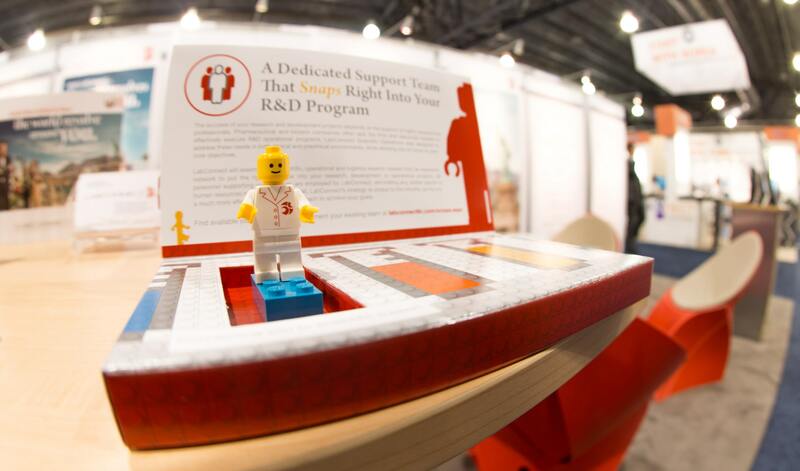 Built with nubby Lego bricks, the mailer featured a custom sourced Lego man representing LabConnect support personnel. The inspired 3-D design emphasized LabConnect’s ability to quickly assemble teams of scientific operations and logistics experts who can connect with companies’ research, development and operational projects. The LabConnect SciOps program helps pharmaceutical and biotech companies avoid time- and resource-draining staffing problems, freeing them to focus on core objectives. 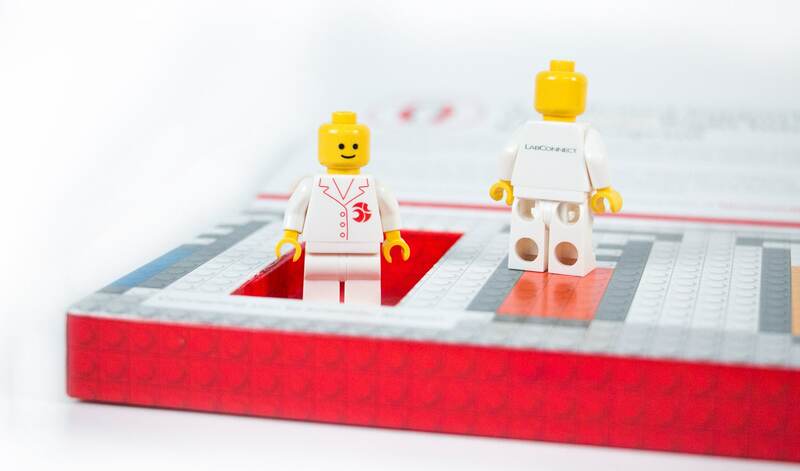 The Lego mailer delivered as promised — boosting brand awareness and lifting sales callbacks. 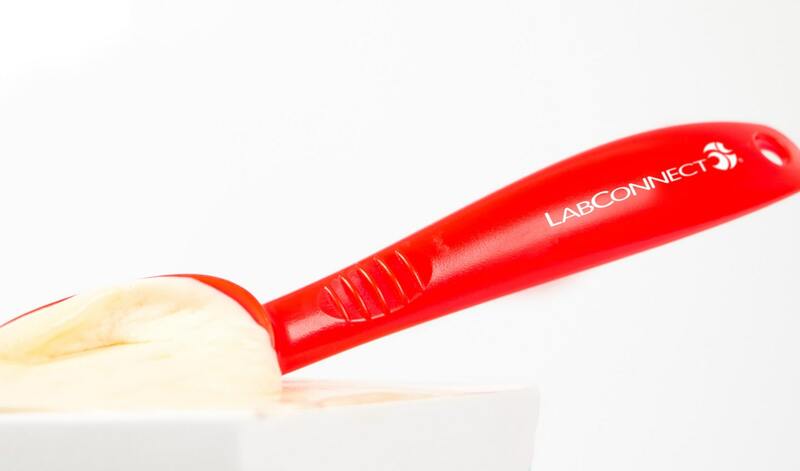 Finally, to educate its audience about its newly improved sample storage abilities, LabConnect shipped a delightfully different product — frozen pints of ice cream alongside branded scoops — to a targeted audience. In this fun and delicious way, LabConnect illustrated how it ensures sample integrity by maintaining consistent temperatures during shipment and storage. Sent also to key industry publications, the mailer piqued their interest, resulting in inquiries and published articles on biorepository and cold-chain logistics and continuing to ensure LabConnect’s reputation as a thought leader in this field. 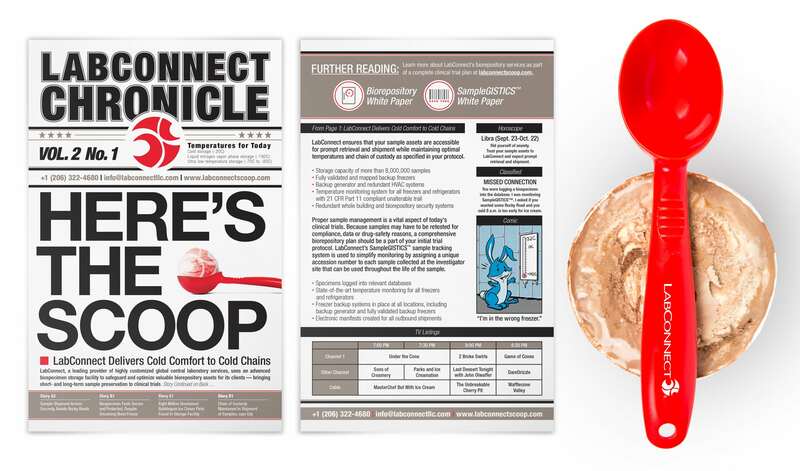 In addition to the fun storage containers, SCORR invited LabConnect’s audience to “get the scoop” in the “LabConnect Chronicle,” which allowed customers and prospects to read up on the company’s improved cold chain logistics while enjoying the fresh ice cream. 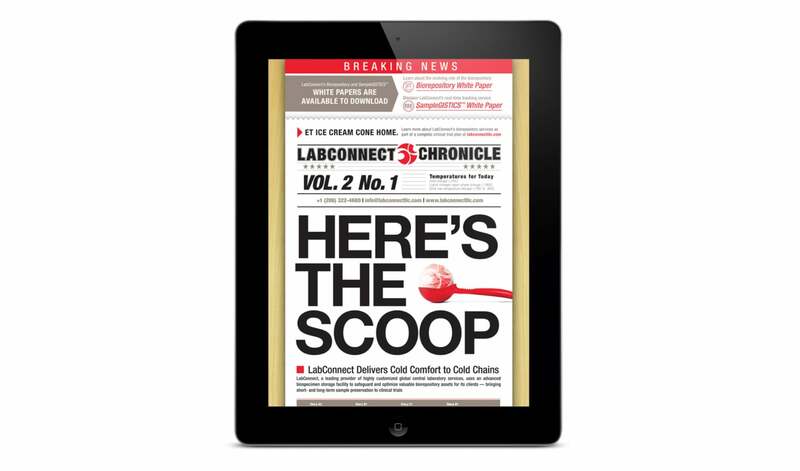 The LabConnect Chronicle’s call-to-action led readers to a landing page specific to the mailer. The landing page (formerly LabConnectScoop.com) served as a portal to download white papers about the company’s biorepository and sample tracking services, providing further information on the company’s sample management and logistics capabilities. At the same time, SCORR developed digital ads that directed viewers to the landing page to download white papers about its biorepository and sample tracking services. These ads also generated buzz for the brand and successfully informed the market of LabConnect’s newest services. SCORR created these marketing tools after collaboratively working with the company to determine which service lines to promote, based on business needs and potential growth opportunities. Through market research, SCORR ascertained LabConnect’s unique differentiators and client benefits to develop the three memorable mailers. 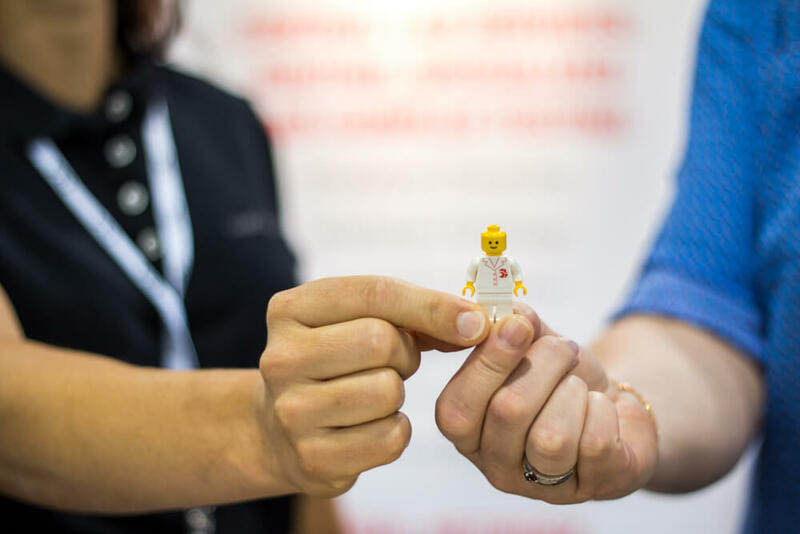 By effectively reaching and engaging LabConnect’s target market, SCORR helped LabConnect advance its brand and improve sales outreach. Share: It’s a 3-D world. So why not market that way?